In cities and countries around the world, billions of people live in slums and shanty towns, doomed by ongoing poverty to grossly inadequate shelter. Solving the global housing crisis has become one of the most urgent imperatives of our time, but doing so without creating problems of ecological degradation and lack of empowerment is a major challenge. 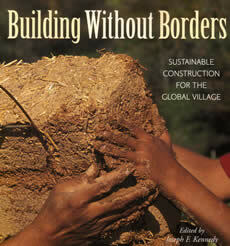 Building Without Borders describes pioneering efforts of those who have taken up this challenge to great effect. It surveys numerous projects that are housing the homeless without destroying natural habitats to do so, by drawing upon local traditions. The book travels from Africa and Latin America, through India, China, and Thailand  as well as Poland and the Southwest of the United State. 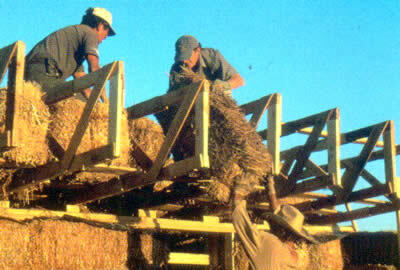 Including contributions from over thirty experienced practitioners, its focus is upon locally sustainable building, covering aspects of international development, appropriate technology, technology transfer, and teacher training, and a special focus on the use of natural building for displaced populations, refugees and in disaster mitigation. Highly illustrated and popular in style, it includes case studies, technical information, and the latest thinking on truly sustainable construction. Following are excerpts from the introduction by Joseph F. Kennedy, Co-Founder, Builders Without Borders, an international consortium of natural builders and architects serving homeless and under-housed populations. Many participants in the Ecomaterials Conferences (1998 & 2001)will recognize some of the contributors: John Norton and Gernot Minke or Kathryn Rhyner-Pozak. The book is a worthwhile addition to the libraries of those interested in sustainable construction. It is available in English from New Society Publishers www.newsociety.com (ISBN 0-86571-481-9). Installation, training and setup of workshops: MicroConcrete Roofing tiles, Puzzolanic cement, concrete precasts.